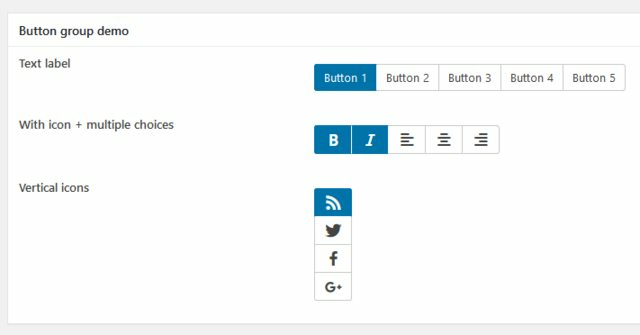 The button groups allows you to select one or more options by enabling buttons from a button group. This field is helpful when you want to display choices in the style of a toolbar. options Array of 'value' => 'Label' pairs. value is stored in the custom field. Labels can be any text or HTML string. You can set label to Text 1 or dashicon like <i class="dashicons dashicons-editor-bold"></i>. Required. inline Whether to display buttons horizontally (true - default) or vertically (false). This field saves value(s) in the database. If field is multiple, then each value is store in a single row in the database with the same meta key (similar to what add_post_meta does with last parameter false).